Be the first to share your favorite memory, photo or story of Shirleyanne. This memorial page is dedicated for family, friends and future generations to celebrate the life of their loved one. 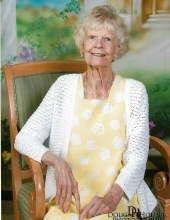 DURHAM: Shirleyanne Hunike passed away Saturday, March 23rd 2019 at the Durham Regent Retirement Community. Shirleyanne was born and raised in St. Louis, Missouri, where she earned a BA from Washington University School of Education. Carl Louis Hunike Jr. won her heart and they married. After several years teaching elementary school, Shirleyanne made a career change by raising four daughters (Carolyn, Nancy, Joy and Diane) and 2 sons (Mark and Michael). Shirleyanne and Carl raised their children in St. Louis Missouri, White Plains, NY and finally in Durham, NC. Shirleyanne’s family grew further with the addition of fourteen grandchildren and seven great grandchildren. Besides her greatest roles as Wife and Mother, Shirleyanne pursued many interests including, sewing, quilting, reading, theater and gardening. She volunteered 41 years with the Nearly New Shop in Durham, as well as 39 years in the Duke Regional Hospital gift shop. She was an active member of Grace Lutheran Church for over 50 years. Shirleyanne has been loved by many and will be remembered for her inquisitive mind, welcoming spirit and loving heart. A special and grateful thanks go to all the care providers and friends at the Durham Regent for the past 10 years of friendship and service. A funeral service will be held at 10:30 a.m. on Saturday, March 30th at Grace Lutheran Church. The family will receive friends immediately following the service at the church for a luncheon. To send flowers or a remembrance gift to the family of Shirleyanne Hunike, please visit our Tribute Store. "Email Address" would like to share the life celebration of Shirleyanne Hunike. Click on the "link" to go to share a favorite memory or leave a condolence message for the family.